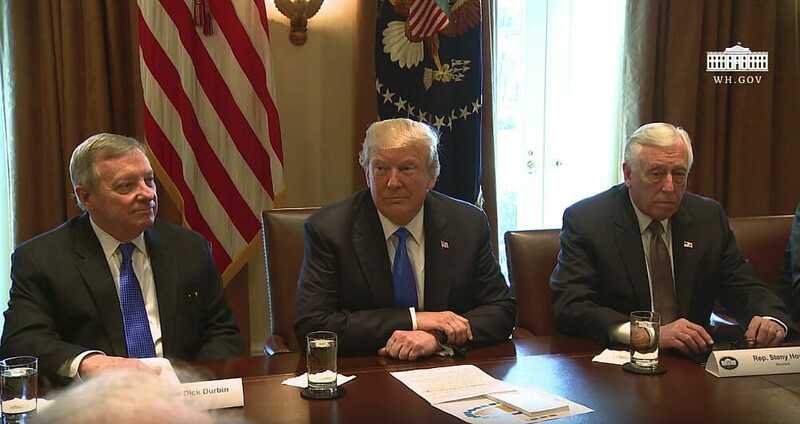 ‘Donald Trump is so mentally unstable that he speaks incoherently, can’t put two sentences together, falls asleep in meetings, and demands obeisance from members of Congress.’ In an open meeting on Monday, President Trump showed the world that he is a true leader. Liberals are hoping that Trump is caving into the pressure they’ve put on him to submit to Democrats. They want the President to give them an amnesty bill so they can add to their voter base and leave national security to be negotiated on their terms. Conservatives are fearful that could happen and America would be lost to immigrants overwhelming citizens to remake America. But as Trump proved he is nobody’s fool when Democrats and RINOs brought him a DACA bill that gave them amnesty for their illegals while providing no security for American citizens. They wanted to give benefits to illegals at the expense of American military personnel just as the City of Dallas is using the Police & Fire Pension Fund to finance their Sanctuary City programs. Liberals gladly take from the makers to give to their takers using any excuse such as the problems this fund had in order to raid it as they do Social Security. The city profits instead of the fund during this time of economic boom leaving retirees of the police and fire departments to subsist on less than that for which they contracted to risk their lives. Just as they steal from retired citizens to provide for illegals, Democrats also would steal from America’s protectors to give to deadbeats who steal into America’s home. Illegals sponge off the people who work for a living under the guise of being refugees when most come from countries whose socialist governments they helped create. Now they would do to America what they did to their homelands. Liberal reviews of the meeting clearly exhibit that liberals don’t have the first clue how negotiations, business, or Congress works. A liberal judge ordered a halt to Trump’s DACA plans, but such an order is as illegal as DACA itself that Obama created from the White House. America is in desperate need of immigration reform that would enforce existing laws, stop the Democrat’s importing cheap labor and welfare voter slaves, keep Islamists and socialist slaves out of the country, and help put an end to Democrat voter fraud. Democrats need an ignorant and dependent populace to vote to keep them in power so they can steal wealth from those who are successfully living the American Dream. Their dream is to take that wealth for themselves and give it to their deadbeat supporters who aren’t willing to work for it like patriotic Americas do. America’s wealth was built through business and trade, not through government benefits. Liberals who believe high taxes will solve their problems are dupes to the elite Democrat leftists that would rule through deception by keeping the people ignorant.